My eyes and fingers need a rest. I have sore fingers and equally tired eyes but I have loved every minute of the time I've spent making these last few pieces where I've had to mix and match the beads and then twirl the wire at the end of each bead. 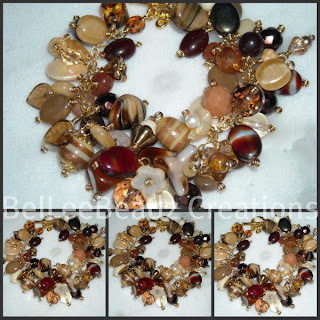 Not complaining though but it has been very time consuming ;p This lovely rich cafe au lait or latte concoction of czech glass beads is a private order for this style of bracelet but using beads with a cream/brown/beige mix. Whilst I have carefully selected the beads for all the recent creations using a multitude of czech glass beads, the real beauty of these beads will only be appreciated when the owners receive their packages.